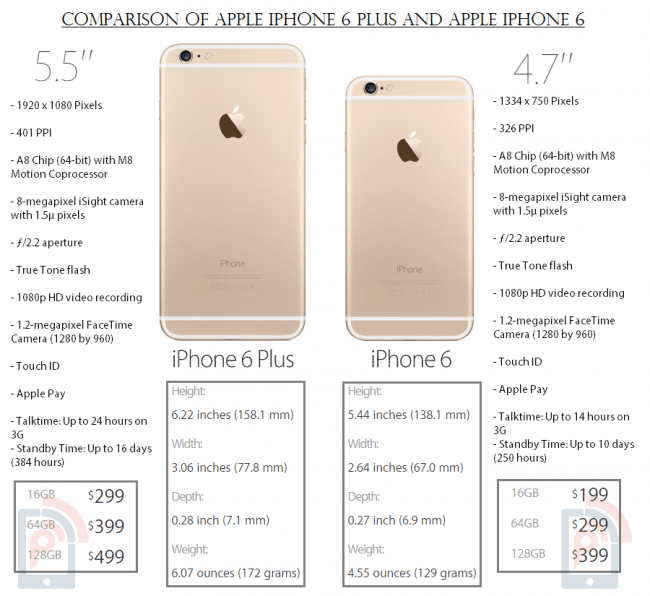 How good is the Apple iPhone 6 Plus compared to Apple iPhone 6? Apple might call this new iPhone revolutionary, and Apple has been calling each of their gadget as revolutionary during the launch, but this time, what is rather interesting is Apple’s step to make larger screen iPhone, and the company has chosen to come up with two devices, one with 4.7-inch screen and other with a 5.5-inch one. Whooping size of 5.5-inch? wasn’t that Samsung’s territory and wasn’t Samsung always criticized by every other brand and especially Apple, whose heads always said large screens look like skateboards. But the time had come for them too, to bring out devices which had larger screen sizes than the current 4-inch ones. While these two new smartphones have different screen sizes and resolutions, the internal specifications are nothing different except for the battery and little other differences in the UI, such as the landscape mode home screen and content optimized for the large screen. After having seen the iPhone with only the small screen for years, there would be one major question for many who are thinking to put their money on the new iPhone. Is the large screen any good? and if the larger 5.5-inch iPhone Plus much better than the iPhone 6 4.7-inch one? Let’s check what actually is different between these two smartphones from Apple. Firstly, the design – both the phones come with the same curved sides and the protruded camera on the back side. But, while the iPhone 6 will still be comfortable to hold in the hand, it has a thickness lesser than the larger iPhone, as the iPhone 6 is 6.9mm thick compared to 7.1mm thickness of iPhone 6 Plus. While Apple has tried to keep the weight of iPhone 6 quite normal at 129 grams, the metal body couldn’t keep it less at 172 grams. The display technology in both the devices is the same, but Apple has chosen to have a better resolution in the iPhone 6 Plus, which has a 1080p resolution (1920×1080 pixels) and pixel density of 401 PPI. The iPhone 6 on the other end has a resolution of 1334×750 pixels, and the pixel density is 326 PPI. Internally, it is the same Apple’s A8 chip with the M8 motion coprocessor in both iPhone 6 and iPhone 6 Plus. Apple doesn’t really talk about the numbers, thus we could learn only from the sources that the 4.7-inch iPhone 6 has an 1800 mAh battery while the larger one has a 2800 mAh battery. There is no difference in the rear camera of both the devices, as the iPhone 6 and 6 Plus have an 8-megapixel rear camera with 1.5µ pixels and ƒ/2.2 aperture, and the autofocus is with Focus Pixels. They can record 1080p Full HD videos at 30fps and 60fps, and Slo-mo video (120 fps or 240 fps). Now, talking about the actual question – is it really worth buying a 5.5-inch iPhone 6 Plus over the 4.7-inch iPhone 6? Apple’s attempt at something new, has never gone wrong. May that be in the music, computers or smartphone category. Samsung, at least for me has been one of the lone strong contenders and clear winner in the phablet category, although LG, Sony and HTC have recently done some great improvements. The Note series now gets one of the best competitors it could get – in the form of Apple iPhone 6 Plus. For those Apple fans who always loved the devices for the UI and still wanted to see a bigger device some day, the 6 Plus is what they should choose over the iPhone 6. Apple hasn’t made it as just-a-bigger-display device, because there is everything similar to the flagship, and the screen size increment has made them add more pixels so that there is no compromise in the content output.